Gesso. If you’ve dabbled in mixed media, you know first hand the power of good Gesso. My newest tutorial will show you some tricks with both black & regular Gesso. Those vibrant and bright spring clay colors and paints are just a preview of the gorgeous colors I’ve picked for you to sample this spring. Don’t miss my article tomorrow (4/20) on the Sculpey Blog. My current favorite painting tools include tiny brushes and a toothpick! 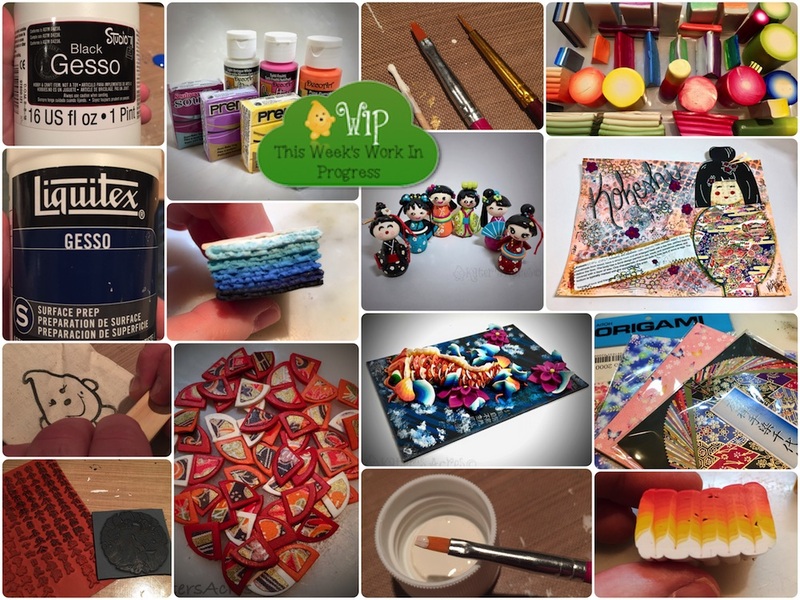 When you are inspired by a theme, like this month’s Japanese Culture theme for Parker’s Clayful Tutorial Club, work with it in any form that comes to mind! This Kokeshi mixed media art page came from the inspiration of the Kokeshi Dolls tutorial. Like origami, rice, and chinyogami papers? My newest Koi Fish tutorial will show you how to use them with polymer clay. QUICK TIP: Don’t take paints out of the bottle if you’re using a small amount, just dip the tip of your brush into the lid! All those little scales were individually handmade for Mr. Koi. It was a lot of work, but well worth the end result. I have a ton of stamps in my stash, but I love collecting rare and unique stamps! I often buy stamps and cut them apart in their sheets so I can use them individually. The two stamps here are from Lisa Pavelka and Barbara McGuire. All our designs go out in custom bags. Someone has to make them. As always, I don’t do it alone. Mr. Katie is helping me stamp them. And because pretty blends deserved to be photographed every time … this blend eventually became the water for Mr. Koi. Polyform’s newest liquid clay: Sculpey CLEAR releases later this month, look for it this Spring, it’s going to be a hit! As soon as I can get some, I will review it for you. I’m the blogger this month over at Polyform. Be sure to look for my articles later this week and project later this month. is all about Japanese Culture this month. There are two AWESOME tutorials you are NOT going to want to miss: Kokeshi Dolls & Koi Fish Mixed Media. Don’t forget that if you sign up to join the club anytime before the end of the month, you get BOTH tutorials for $9.95! That’s a HUGE savings over their list price. It’s week 17 of the #2017PCChallenge and it’s not too late to join the fun. Come on over and join the 2017 Polymer Clay Challenge. Looking for something fantastic and all together wonderful? Check out gakman.e on Instagram. Ekaterina build stuffed toys with polymer faces, hands, and feet. Totally wonderful! Visit her Etsy shop here. Astrid from Makosla shares work in progress shots of her current dragons. She sculpts large dragons with gorgeous details. Don’t miss her on Instagram. Check out these gorgeous carnival beads by Kristin Halvorsen! Find them on Flickr. Christina Patterson is making a book of A-Z characters. Follow her progress on Flickr. What do you do with your scraps? Martin Pottjewijd of Martin Pottjewijd Creations has sculpted for so long he’s beginning to see things. (Personally I think he should bake his scrappy monster, name it, and make it a new studio mascot). What is inspiring YOU right now? Leave your thoughts in the comments below.